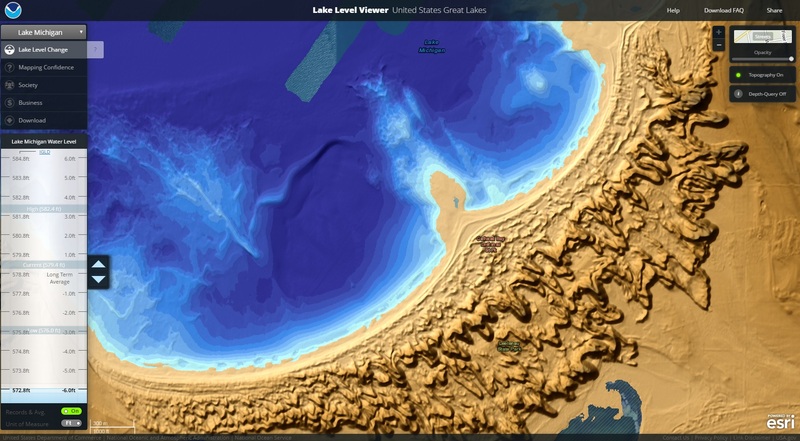 This web-based tool creates visuals that capture lake level changes that range from six feet above to six feet below historical long-term average water levels in the Great Lakes. Potential shoreline and coastal impacts are also provided. This information can be used to determine appropriate preparations, including zoning restrictions, infrastructure improvements, and habitat conservation. Funding for this project was received via President Obama’s Great Lakes Restoration Initiative. 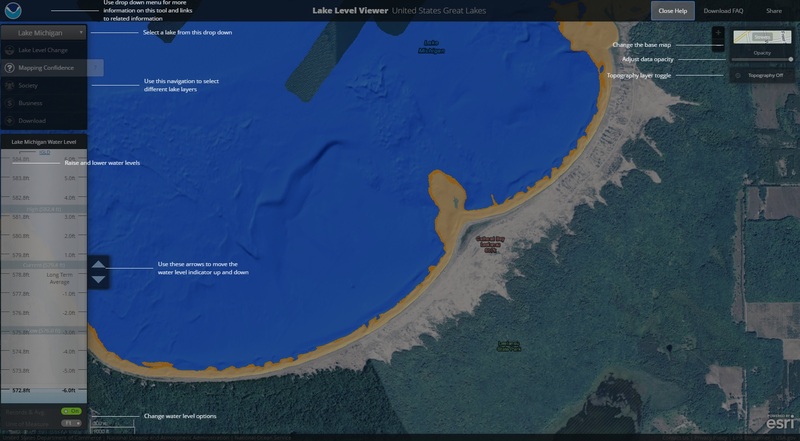 Water levels referenced in this tool are provided by the NOAA Great Lakes Environmental Research Laboratory’s Great Lakes Water Level Dashboard. The NOAA Office for Coastal Management would like to acknowledge those organizations that provided direct content for this tool or feedback, ideas, and reviews over the course of the tool’s development. Specifically, the office acknowledges the following groups. 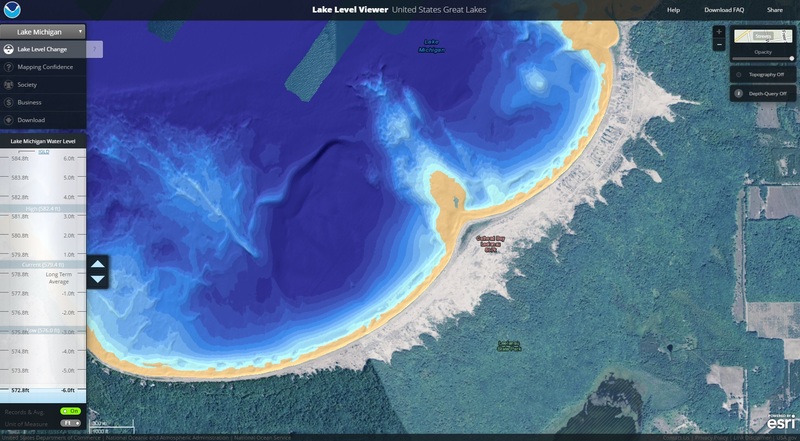 The U. S. Army Corps of Engineers’ National Coastal Mapping Program provided topographic and bathymetric lidar for the Great Lakes shorelines and shared these data via NOAA’s Digital Coast. The Great Lakes Sea Grant Network assisted in requirements scoping and usability testing on the application. 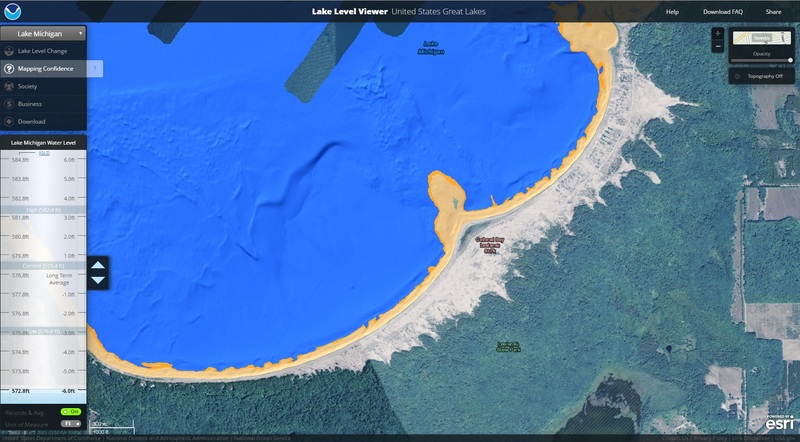 NOAA’s Great Lakes Environmental Research Laboratory allowed the use of its lake level reference data and coordinated with us to create two complementary water level-related products. 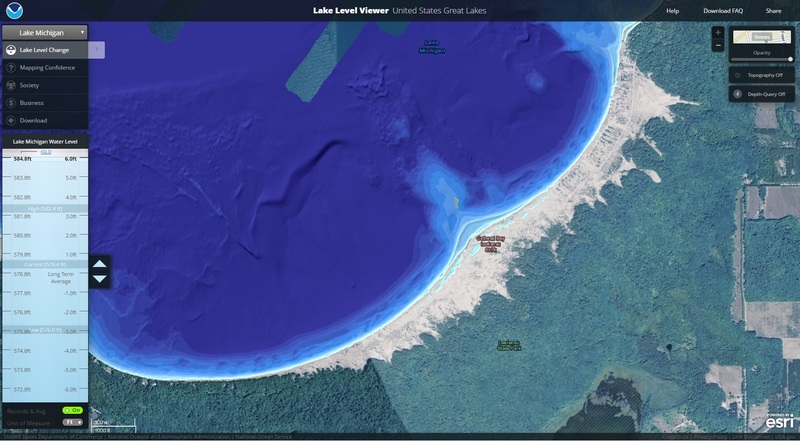 NOAA’s National Centers for Environmental Information created and hosted the digital elevation models upon which the water level information was built. NOAA’s Coastal Storms Program provided funding for an initial requirements scoping workshop. Participants in the NOAA Shoreline Change Virtual Workshop of 2013: Perspectives on the Great Lakes (July 10, 2013) provided valuable feedback. Focus group participants (August 15, 2013, and September 17, 2013) provided information on tool functionality and helped inform requirements for the application. To launch, please visit https://coast.noaa.gov/llv.